Ruth Ozeki has always tackled big themes in her writing. Her first book, “My Year of Meats” (1998), universally beloved by all who discover this slender volume, is a funny and eye-opening examination of the American meat industry. It’s also a cross-cultural study that draws together two women—a Japanese housewife and a Japanese-American woman in the US. In Ozeki’s second book, “All Over Creation,” (2003) a family of potato farmers unwittingly become the center of a group of eco-activists who share the old farmer’s resistance to genetically engineered seeds and promote sustainable farming. “All Over Creation” also includes a culture-clash; members of the small town in Idaho acclimated slowly to the farmer’s Japanese war bride, and their daughter always felt like an outsider, especially at home. One of the marvelous aspects of Ozeki’s work is that it has a strong didactic quality—while you’re enjoying a great story and rich characters, there’s the added benefit of learning about growth hormones or the history of the potato. She manages it so gracefully, slipping in solid information about what’s in our food without preachiness. Years before Michael Pollan started something of a food revolution with “The Omnivore’s Dilemma,” Ozeki was quietly educating her readers with these charming novels. It won’t surprise her fans that Ozeki’s latest novel includes a cross-cultural element and folds in larger themes. She moves away from food (although there remain elements of the eco-warrior) and moves on to nothing less than time and space. 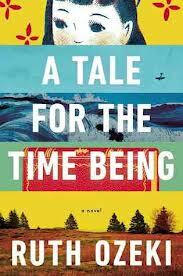 “A Tale for the Time Being” centers around a diary that washed up on the shore in British Columbia. It is found by Ruth, who tries to unravel the mystery of how this package made its way across the ocean and what happened to the author. Ruth suspects that the package was lost in the Japanese earthquake and tsunami of 2011. The author of the diary is Nao, a miserable sixteen-year-old Japanese girl, recently displaced from her home in California after her father lost his job and his visa. Nao is horribly bullied in her new Japanese school and writes in her diary that she’ll be dead soon. Despite the dreariness of her situation, she’s an unexpectedly amusing narrator. Ozeki imbues her voice with youthful vitality and an outsider’s view of Japanese society. Nao writes most of her diary from a cafe, mixing in stories about the waitresses dressed in french maid costumes, frequented by the odd “otaku salaryman.” She writes out of loneliness, but truly wants to make a connection to whoever finds it. Where Ozeki literally enters some higher-level theory in “A Tale for the Time Being” is correlating quantum physics with the relationship between these women. Two particles (Ruth and Nao) respond to each other despite being separated by time and space. In quantum mechanics, this is known as “entanglement.” Quantum physics is cropping up in contemporary fiction with some regularity lately—perhaps most notably in Jennifer Egan’s Pulitzer Prize-winning “A Visit from the Goon Squad.” What’s interesting is that, in the case of both Egan and Ozeki, the authors circle around the theories of quanta and then explicitly state the specific influence of quantum physics. Ozeki even goes so far as to put a dying cat (named Schrödinger, no less) into a box in her novel. It’s not subtle, but one assumes the general public’s working knowledge of quantum physics doesn’t allow for much subtlety in this area. Ozeki brilliantly connects quantum theory to Zen Buddhist practice when Nao is sent to live with her 104-year-old grandmother, a Buddhist Nun. She observes nondualism, or the interconnectedness of everything on earth—not so different than the entanglement of particles.